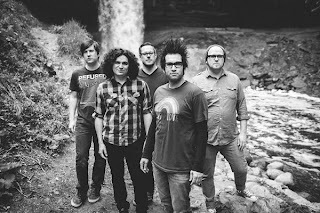 Pop-punk mainstays Motion City Soundtrack released Go, their fifth studio album, last year, on which frontman Justin Pierre explored dark, psychological themes, wrapping morbid poetry around propulsive riffs and shout-along hooks. He's changed his perspective a bit on the band's new single, "Inside Out," which will be officially released tomorrow. "'Inside Out' is how we're feeling these days," Pierre tells Rolling Stone. "We have all this creative energy clawing to get out and a sudden overabundance of material. We've upped the tempos from our last endeavor a bit and are focusing on having fun and making rock. This song came together incredibly fast, from inception to completion, and we couldn't wait to put it on an album. So here it is." Check out an exclusive stream of the track below. The band kicks off their fall tour on October 3rd with a show in Pittsburgh. Check out the full schedule on their website.